SEATTLE, WA (January 13, 2019) – B.E. Meyers & Co., Inc. is proud to announce the recent additions of Curtis Blue Line, Green Line Tactical, KF Armory, LLC, N.S. Defense, and Victory First as official resellers. These companies are joining B.E. 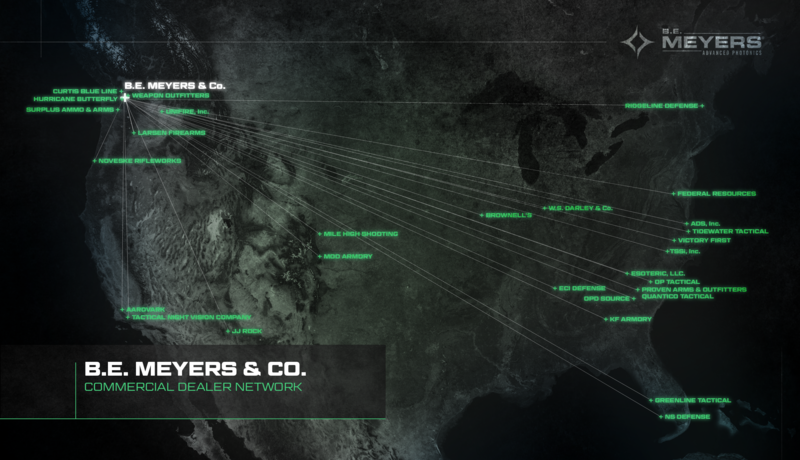 Meyers & Co.’s nation-wide network providing advanced laser and solutions with a focus on federal, state, and local law enforcement, as well as commercial markets. B.E. Meyers & Co. also has extensive international representation in Canada, Europe, the Middle East, South East Asia, and Australia. “The welcome addition of our new Resellers represents a necessary broadening of our partnership approach with excellent small businesses that are able to promote B.E Meyers products into our valued customer base,” said Jamie Wilford, B.E. Meyers & Co.’s Director of Global Business Development. As a 44-year family business now in its second generation of leadership, B.E. Meyers & Co. Inc. has maintained an end-user focus while continually innovating in the design and development of advanced photonic solutions. B.E. Meyers & Co. Inc. is an ISO 9001:2015 certified facility located in Redmond, Washington, with all products made in the USA.